SecureAire’s APS-2000X is an Air Handler System that utilizes Active Particle Control Technology. The ACS is the most advanced and optimized Electronically Enhanced Air Purification System available in today’s marketplace. Inside the APS-2000X, you will find a direct drive fan, the ACS System, and variable speed controller. This is a complete system that can deliver up to 2000 CFM of particle-free air. The system is placed above the ceiling, in the ductwork, thus treating the specific and desired space. The APS-2000X is designed to maximize particle control by optimizing the three components that dictate air purification. 1. Particle Coagulation: In order to overcome the dominant electromagnetic transport control mechanism of small particles, Particle Coagulation creates larger particles making airflow the dominant transport mechanism. 2. Optimized Air Change Rate: This brings particles back to the filter for removal or sends them to a dedicated exhaust. 3. Low Static Pressure Drop Filter: The utilization of an efficient, low static pressure drop/high efficiency filter helps in the removal of particles and helps to maintain a reduced fan size. 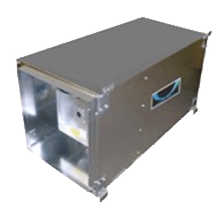 Compact horizontal air handler that can be mounted into existing ductwork. System provides up to 2000 CFM of additional fan powered airflow. Indoor Air Quality can be dramatically improved without major HVAC Renovations. SecureAire provides… Healthy, Clean, Safe and Energy Efficient Indoor Air!